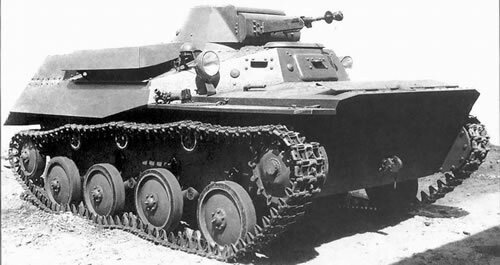 The Russian T-40 Light Tank was a reconnaissance tank with a strong amphibious capability, being propelled in the water by a propeller it is equipped with flotation tanks in the rear of the vehicle to provide buoyancy in the water. Development ended in 1938 and production started in 1939 using many car and truck components to speed up production. Limitations were exposed due to its thin armour. Attempts to up armour it would have sacrificed its amphibious capability, so only 225 were built in a limited production run which was replaced with more capable tanks.